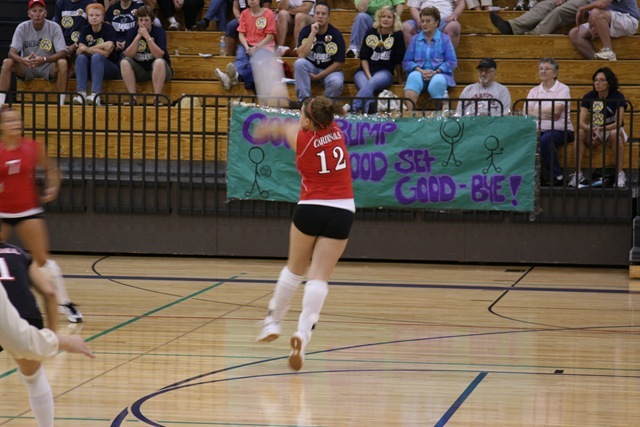 September 17, 2008 | By Patrick | Filed in: HKS, Volleyball. In addition to her current stint on JV, Hannah has been fortunate enough to suit up a few times for the Marshall Varsity volleyball team. 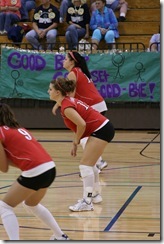 In case it’s been a while since you’ve seen high school volleyball, the Varsity teams play 4-game matches. She has seen minimal time with the regular team (usually in game 3), but has played all of game 4 with the other subs a few times now. 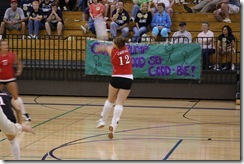 The experience she is gaining is well worth the extra time and effort of playing double matches on the same night. She plays almost all of the JV match, makes a quick change into her varsity jersey, then comes out to the blaring intro music (kids these days…) with the rest of the varsity team. More warm-ups, then it’s time to sit and wait for an opportunity at the end of the bench. Incidentally, Marshall had a match at home last night against Cambridge. The JV squad went 3-0 (a pleasant surprise) while the varsity team went 0-4. They were flat (slow) and couldn’t pass or return a serve at all. They should have at least competed for wins instead of being soundly beaten. For their efforts, the varsity players were rewarded with an extra practice session at 6:15 this morning. Hannah was “invited” to participate and was ready to go at the appointed hour. By the way, it’s still quite dark at 6 in the morning. Yes, I won the lottery and got to play chauffeur. It wasn’t really a problem since I was leaving early to play golf anyway.